It got me thinking—there has to be another (more comfortable) way to treat skin rashes. Medical treatments and ointments are often prescribed by doctors, but sometimes these treatments can result in adverse side effects that inflame the skin even further. Let’s take a further look at what causes skin rashes and the best homeopathy treatments that can relieve them. 1. Eczema: This is a group of skin conditions caused by inflammation of the skin. Eczema is also referred to as atopic dermatitis, one of the most common types of skin diseases. 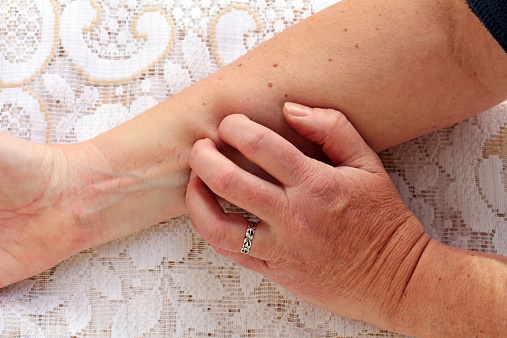 Eczema causes the skin to itch; at times, the itch will start before the rash even appears. Affected areas are typically extremely dry or scaly. The area of skin appears slightly red amongst fair-skinned individuals, and can result in a slight change of pigmentation (lighter or darker) among darker-skinned individuals. The infected patches of skin can often blister, which results in a discharge of fluids—this will turn everyday activities into quite an uncomfortable experience. Some elderly people tend to experience varicose eczema—this is when the skin becomes dark, itchy, and inflamed. 2. Psoriasis: Symptoms vary, but psoriasis sufferers typically see dry (often red) patches of skin covered with scales. Skin may bleed and feel itchy and sore. The main types of psoriasis are plaque psoriasis, guttate psoriasis, and pustular psoriasis. Plaque psoriasis tends to develop on the knees, elbows, lower back, and even on the scalp. Guttate psoriasis will be scattered throughout the body, while pustular psoriasis typically spreads to the palms and soles of the body. Psoriasis is considered to be a hereditary skin disease that tends to flare up for people who are in their late teens or early adult years. 3. Acne: Acne is triggered when the skin produces too much sebum. Sebum is supposed to prevent the skin from drying out, but when an excessive amount of sebum blocks the hair follicle openings in the skin, bacteria will multiply, leading to pimples and inflammation. • The infection can be the result of a certain chemical or substance that you consumed or interacted with. • Heat can cause a rash; in some cases, it can be caused from the constant sweat and friction from your clothing. • Your immune system could be reacting differently to certain medications. • Some believe that oily skin and alcohol-based lotions can result in severe rashes, because there are chemicals in those products that open up your pores. When the pores are open, your skin is more susceptible to dirt and allergens that can seep into the skin. • Age, stress, fatigue, and immediate weather changes (especially summertime when the temperature becomes extremely humid) can cause skin rashes. • In some cases, skin rashes are hereditary. Atopic dermatitis eczema, for example, tends to run in the family. • Graphites: This carbon is typically diluted before being converted into liquid form, pills, or a powder. It has been known for treating scabby eruptions on the scalp, joint scabs, and scabs between the fingers and behind the ears. It is also good for treating eczema that erupts in the folds of the skin and for sticky, “gluey” liquid that oozes from the skin. • Arsenicum album: Arsenicum derives from arsenic; it is typically ground into a powder and diluted with lactose. It is sold in liquid form, tablets/pellets, or as a powder. It can treat thickening of the skin, severe itching, burning, and swelling; it has also been known for reducing the pain and symptoms associated with hives. • Sulphur: Beneficial for dealing with severe itching and burning that erupts from constantly washing the rash. • Mezereum: Mezereum derives from the deciduous shrub and is particularly useful for treating stubborn eczema, psoriasis, and skin inflammation. Mezereum is a good remedy for itching and irritation from scratching. • Nitric acid: This mineral acid is typically prescribed on a case-by-case situation, depending on one’s physical conditions; but there are studies where patients have used nitric acid to treat their vicious skin disorders (i.e. abscesses and cysts) with positive results. It’s also known for treating mouth ulcers and canker sores. • Pulsatilla: This plant is typically dried out and applied directly to the skin to treat boils and bacterial skin infections. “Spotlight on Skin,” British Homeopathic Association web site; http://www.britishhomeopathic.org/bha-charity/how-we-can-help/conditions-a-z/spotlight-on-skin-2/, last accessed May 29, 2015. “Eczema: Homeopathic Help for Sore and Itchy Skin,” Homeopathy Plus web site; http://homeopathyplus.com.au/eczema-homeopathic-help-for-sore-and-itchy-skin/, last accessed May 29, 2015. “Homeopathy for SKIN DISEASES Eczema, Allergic Dermatitis, Uriticaria, Skin Allergy, Psoriasis, Herpes etc.,” Hpathy web site, May 14, 2014; http://treatment.hpathy.com/homeo-medicine/homeopathy-skin-diseases-eczema-allergic-dermatitis-uriticaria-skin-allergy-psoriasis-herpes/. Sharma, V., “Top 5 Homeopathic Remedies for Skin Rashes,” Dr. Homeo web site; http://www.drhomeo.com/skin-problem/homeopathic-remedies-for-skin-rashes/, last accessed May 29, 2015.